Buying or refinancing a home can be stressful, especially if it’s your first time. We researched the best mortgage lenders in Oklahoma City to help you find a mortgage loan. See how our national top pick stacks up against local mortgage lenders in the OKC metro area. We thoroughly researched company reviews, brand reputation, loan types and fees. Close in as few as 25 days! There are plenty of mortgage lending options when it comes to buying a house in Oklahoma City. We checked into home prices, school systems and crime rates in multiple neighborhoods to give you some insight into the Oklahoma City real estate market before you begin researching mortgage companies in Oklahoma City. The Oklahoma City real estate market is fairly stable when compared with other states. About nine percent of homes in the city owe less than their house is worth–the national average is just over 10 percent. Oklahoma City’s housing market stability, coupled with lower home prices, make it a great city to get a mortgage and invest in a home. There are plenty of mortgage companies in OKC to help you get the process started. The median home price in Oklahoma City is close to $143,000 with just over 40 percent of home prices falling in the range of $113,000 to $226,000. Just over 2 percent of homes are over half a million dollars while a little more than 12 percent of homes fall below $56,000. These home prices mean most houses in the city will be eligible for an FHA loan, which is ideal for borrowers who want a lower down payment. The Oklahoma City housing market has cooled off a bit since a spike at the end of 2016. Home prices have increased just over one percent in the past year and are expected to rise nearly three percent in 2018. The overall trend for Oklahoma City home prices is fairly strong, showing a steady increase over the past eight years, with the exception of a dip at the end of 2016. If you’re looking at buying a home in Oklahoma City, make sure you work with your realtor and mortgage lender to find good mortgage rates in these popular and up-and-coming neighborhoods. Once you find the perfect home, your mortgage company can work with you to lock in the lowest home loan rate possible and make sure you’re investing in the best type of mortgage for your circumstances. Nichols Hills: Nichols Hills is northwest of the I-44 and I-235 merger. While it’s the safest area in the Oklahoma City area, it’s also the most expensive. The median home price in Nichols Hills of $503,000 reflects the area’s low crime rate and higher-end amenities. This area is a great place to live if you like eating out and shopping. There are plenty of options available nearby. If you’re shopping for a Nichols Hills home, you may want to consider applying for a mortgage with AmeriSave, because they offer non-conforming loans, which are allowed to be larger than some federally-backed mortgages. School districts nearby include the highly-rated Bethany, Oakdale and Deer Creek districts, as well as the average-rated Putnam City school district. Warwick Estates: This area is northwest of Lake Hefner, south of NW 122nd Street, north of Kingsbridge Drive and east of MacArthur Boulevard. The median home price is around $285,000. Residents in this area enjoy a lower-than-average crime rate and a variety of outdoor activities thanks to its close proximity to Lake Hefner. Bluff Creek Park is also nearby, which has a multi-use trail for hikers and mountain bikers. Kids in this neighborhood will attend Putnam City North High School, which is one of the top-rated high schools in the Oklahoma City area. Crown Heights: The Crown Heights area is located just northwest of NE 36th street and I-235. It’s made up of mostly historic homes. These homes don’t come up for sale too often, making it a sellers market. Very few homes are listed under $200,000, with most hovering around $500,000. Homes may sell quickly, so use a mortgage lender that gives you a dedicated mortgage banker to speed the process along. Crown Heights is a tight-knit, social community that works with the homeowners association to make sure the area stays beautiful and property values remain intact. Crime rates are about average, with most crime being non-violent. Linwood: Located just west of downtown Oklahoma City, east of I-44 at NW 19th Street, Linwood is an area made up of restored historic homes with a median price range of around $205,000 to $230,000. Homeowners in this area are a bit younger, with a median age of 34. The median household income is $62,000. Many people in this age group and income bracket prefer mortgages with a lower down payment. Linwood Elementary is considered the best school in the area, and the Linwood area boasts short commute times, walkable streets and pedestrian-friendly neighborhoods and parks. Mayfair Heights: Mayfair Heights is northwest of downtown Oklahoma City, north of I-44 between NW 42nd Street and NW 50th Street. It has a median home price of $164,000, which has leveled off and remained fairly steady over the last year. 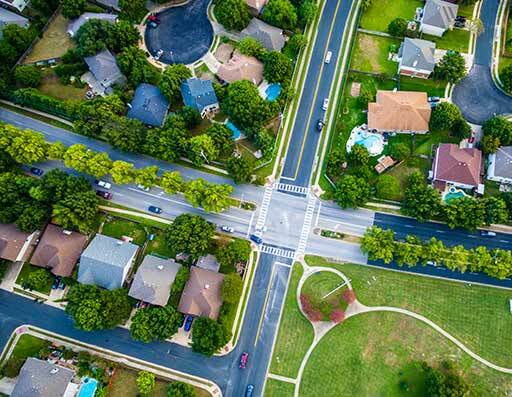 Residents love the neighborhood for its mid-century homes, old trees, new sidewalks and closeness to food, parks and shops. Gatewood: Gatewood is an area northwest of downtown Oklahoma City bordered by N Classen Boulevard, NW 23rd Street, NW 16th Street and N Pennsylvania Avenue. Residents consider it to be funky, friendly and community oriented. Gatewood is made up of restored early to mid-1900s bungalow-style homes with a median price of around $200,000. Gatewood is located close to two well-ranked schools – Classen High School of Advanced Studies and Classen Middle School of Advanced Studies. Whether you’re buying a new home in Oklahoma City or refinancing an old mortgage, AmeriSave has a variety of mortgage loan options. The company boasts an easy-to-use platform, which makes it possible to apply for and request a rate-lock in minutes. Choose from multiple mortgage loan types including federally insured loans, fixed-rate mortgages and non-conforming mortgages. American Equity Mortgage offers a variety of mortgage loan programs, including home-purchase loans, mortgage refinancing and debt consolidation home loans. Its loan originators live and work in Oklahoma City and have specialized knowledge and understanding of the residents’ needs. Online reviewers love the originator’s work ethic and dedication through the entire mortgage loan process. Executive Lending Group offers FHA loans, VA loans and reverse mortgage loans, as well as multiple refinancing options in Oklahoma City. Get pre-approval, a refinance quote and a new mortgage loan quote from the convenience of your mobile device or computer. Online reviewers give Executive Lending Group five stars and praise its personalized service. First Mortgage Company of Oklahoma City offers eight home loan programs, including FHA loans, VA loans, Construction loans and mortgage loans for first-time home buyers. You’ll be working with local employees during the entire process, from origination to closing. RedRock Mortgage offers mortgage refinance options and seven purchase loans including conventional loans, FHA loans, VA loans, USDA loans and reverse mortgages. They don’t outsource any part of the loan process, allowing for a smooth experience from origination to closing. Cornerstone Home Lending in Oklahoma City meets with you face-to-face to determine your finance needs and goals. During your meeting you’ll discuss multiple mortgage loan products and get prequalified for a home loan. Cornerstone also offers a variety of refinancing options and will walk you through refinancing your home step-by-step. Bank of Oklahoma has multiple mortgage locations across Oklahoma City that offer a variety of home loan options like Conventional home loans, FHA loans, VA loans and USDA loans. Whether you’re a first time home buyer or wanting to refinance your current home loan, you can connect with a mortgage banker online. First American Mortgage, Inc. of Oklahoma City prides itself on developing strong relationships with each client to better understand individual circumstances. Your entire mortgage loan process is handled in-house by your choice of one of ten loan officers. You can browse their profiles and reach out to them through their website.